One of the simplest ways to turn an everyday occurrence into an adventure is to invite a toy along. 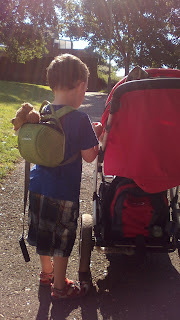 As we were getting ready to walk to the library this morning, Ollie wanted to bring his pram. To save myself from navigating all the road crossings with a toy pram as well as our other paraphernalia, I suggested Ollie took Teddy in his backpack, like I do Toby if I can't take the pram somewhere. So off we set, with Teddy being shown all the sights along the way, and suggestions from Ollie for what books Teddy was going to look for at the library (a book with dinosaurs in it). When we arrived, Teddy found a book we borrowed last year that Ollie had remembered had a dinosaur skeleton on one of the pages, so we sat down and read it together, while little brother Toby cheerfully removed one book at a time from the Thomas the Tank Engine section and brought them to us. When Toby finally got bored and proceeded to full melt down, we gathered up the books Teddy had chosen, took them out and brought them home (with a stop en route at the bakery for Ollie's favourite cherry topped buns). After we got home and the buns had been demolished by ravenous small boys, we read through some of our new books, with Toby and Teddy jumping excitedly around us as soon as the only book that caught his fancy today was finished. 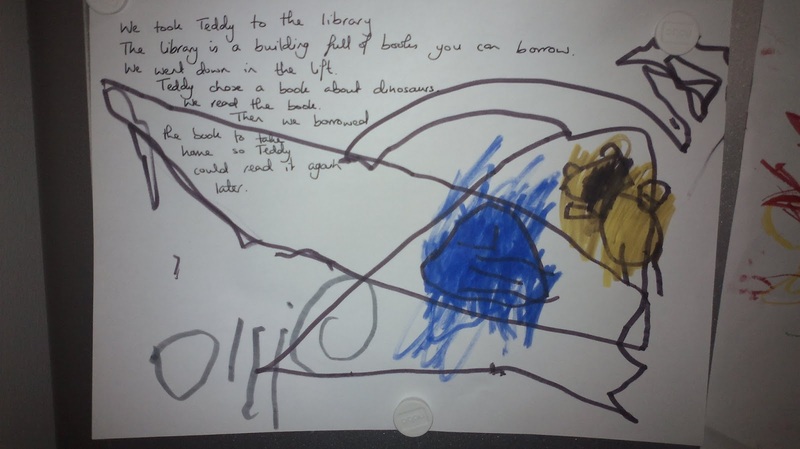 Then later, while Toby napped, we sat down and drew our pictures of Teddy at the Library. Finally we came back to the theme later with Matt reading some of the new books to the boys (and Teddy) at bed time. Themed days are great fun, and don't have to be particularly planned ahead, or rigidly adhered to. The reinforcement of ideas throughout the day cements learning and promotes discussion. Also, the different way of looking at things is appealing to children - for example Ollie likes to take on the role of teacher and tell his toys (or other children, or passing adults) the things he has learned about. Childhood can sometimes feel quite powerless, so putting the child in the position of apparent parental authority over a toy in situations where you normally have the lead can be great for building their confidence, and their vocabulary and reasoning skills too. In addition it can be a way of expressing their feelings in a safe way - when we passed a dog who was barking at a Postman (genuinely, not just a cliche then! ), Ollie comforted his Teddy and told him it was Okay, the dog was just noisy and not scary. I wonder where Teddy will decide to go with us next.